With her friendly smile and can-do attitude, Lisa brings expertise and fun to our DAHLC staff. 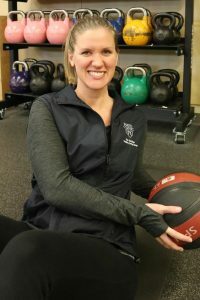 She previously worked as a health coach and fitness instructor in Tampa, Florida before settling down here in the Rochester area. When she's not working, you can find Lisa spending time with her husband and goldendoodle on their farm. She also enjoys being outdoors, spending time in the garden, cooking, camping and cozying up with a good book. Don't let her sweet personality fool you though in her training sessions and classes as she will challenge you to push yourself to achieve your best results!